A sewer backup can cost thousands of dollars to fix as it affects your floors, electrical systems, furniture, walls, and other belongings. However, sewage backups can do far more damage than just hurt your finances—they can cause anyone in contact with the water to become severely sick or worse, cause death. The best way to avoid the costs and consequences is to put sewer backup damage prevention steps into practice. Here are some helpful sewer backup prevention tips you can follow to make sure this does not happen to you. Old Sewer Systems: Systems that are as old as 30 years or more contribute to large increases in sanitary sewer backups, flooded basements, and overflows. Combined Pipelines: Problems with sewer backups also occur when there is a combination of storm water and raw sewage into the same pipeline system. During rain storms, the systems take on more than they can handle, resulting in a sewage backup. Tree Roots: Tree roots seek moisture and draw water near them. Since roots can make their way into sewer line cracks and pipe joints, extensive damage and blockages can occur. Sanitary Main Blockages: If a blockage in your city’s sanitary main remains undetected, in time sewage can back up from the main into homes through floor drains. This process is usually slow, so you may have time to contact your local flood damage restoration company to remedy the situation and keep your home safe. You should never pour hot cooking oil down the drain. Doing so will cause the grease to solidify as it passes through the cold pipes where it can then constrict and clog the pipes. Hot grease should be poured into a heat-resistant container and disposed of in the trash after it cools down. Paper products such as paper towels, disposable wipes and diapers, and feminine products take a long time to deteriorate and can cause serious clogs and troubles in the city main. Avoid throwing these products in the toilet and put them in the trash instead. If tree roots constantly cause problems in your area, have them regularly cut by a professional to prevent them from causing worse issues. Do not connect sump pumps, French drains, and other flood control systems to your sanitary sewer. First of all, it is illegal, and secondly, it can cause debris to clog your line. If there have been any pre-existing illegal connections installed to your home, consult a plumber to have these issues corrected. This fixture is installed into a sewer line in your basement to prevent sewer backflows. If it is properly installed and maintained, it will allow backup sewage to go out, but not return to the home. Instead of using crystal or chemical drain cleaners, which can be harsh and damaging, keep drains free from clogs by this safe and effective de-clogging trick. Flush one cup of baking soda, followed by one cup of white vinegar and warm water. This will flow down the drain removing any debris and polishing the insides of the pipes of any gunk that could cause a clog. Another effective way to prevent a sewage backup in your home is to hire a skilled professional to examine your home. 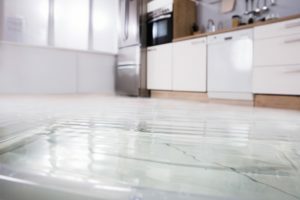 They can identify problem areas that could lead to a future sewage issue, and make recommendations on how you can most effectively prevent backups and flooding from occurring. The best defense against flood and sewer damage to your home is prevention. Unfortunately, some systems are located underground and are not accessible for inspection without the help from a professional team. It is worth the cost to hire a flood damage prevention company to inspect your property for any risks and damage, as it will save you a lot more money in the long-run. There are many things you can do to prevent sewer backups, such as those mentioned above, but if a sewage backup has caught you unnoticed, there is help available. Flood damage prevention and restoration professionals can help you inspect the source of the water damage and mitigate it to get your home back to normal. If you need quick sewage backup cleanup and restoration, Flood Services Canada can help. Our professionals can provide you with several solutions, and we can help you settle with your insurance company to get your life back to normal as soon as possible. We deploy our 24/7 sewage cleanup, and restoration services to provide quick-response action to minimize damage to our clients’ property. Once we arrive on the scene, we immediately begin our sewage cleanup process, and water damage, and food cleanup services. We use the best techniques, personnel, and equipment to ensure your home is clean, safe, and dry as soon as possible. Contact us at (416) 302-2107 to learn more about our services, or use our emergency hotline at (416) 999-3930 to get our rapid-response teams deployed to your location.